Last night, we chatted about news Prince Harry and Meghan had travelled to Nice to celebrate the New Year. 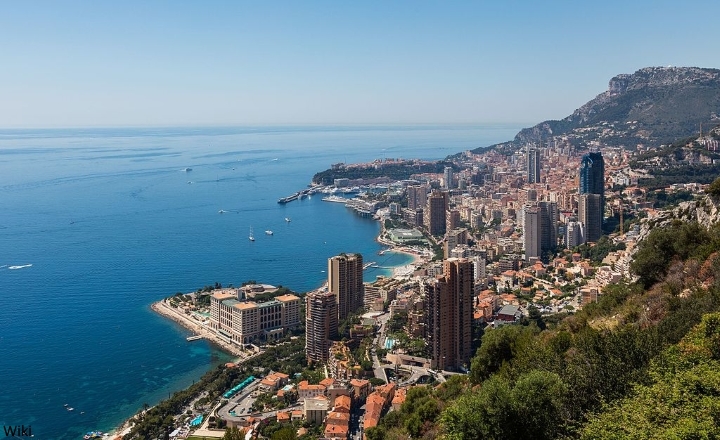 The Daily Mail exclusively revealed they took a helicopter to Monaco and partied the night away in the glamorous principality. 'Prince Harry and his fiancée Meghan Markle flew out of the billionaire tax haven of Monaco on a helicopter today after celebrating New Year ‘partying like tycoons’. A source on the French Riviera told MailOnline that the couple arrived on December 31st and met up with friends. 'There was speculation that the group may have included Prince Albert, and his wife, Princess Charlene, who are the most senior royals in the millionaires' playground in the south of France. Last year, glamorous Princess Charlene joined Prince Harry at Twickenham to watch a rugby match between England and south Africa. The visit was a flying one - the couple were seen boarding a helicopter this morning and returned to the UK. Back in London, the couple will be firmly focusing on wedding planning and a series of engagements around the UK. Kensington Palace confirmed the first of these, will take place next on Tuesday, 9 January. 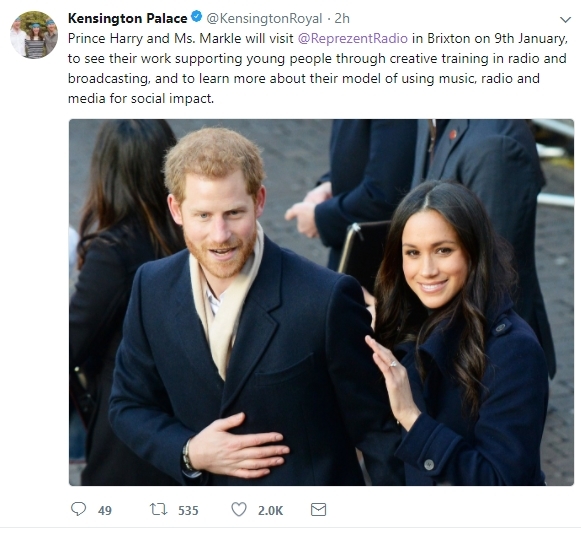 Harry and Meghan will visit Reprezent 107.3FM in Brixton, to see their work supporting young people through creative training in radio and broadcasting, and to learn more about their model of using music, radio and media for social impact. The Reprezent training programme was established in Peckham in 2008, in response to an alarming rise in knife crime, to help young people develop and socialise through radio. Since then, it has transformed into a hotbed of UK music talent. Training hundreds of young people every year in media and employment skills, over 4,000 young people have been through the Reprezent programme, with over 3,000 on the waiting list. It offers accredited training and support in topics ranging from audio and radio production and editing to communication skills and confidence building, work experience and volunteering. During their visit to the station, they will meet some of the presenters, content producers and staff, hear more about their training programmes, and meet some of the current and former volunteers who have benefitted from the training. 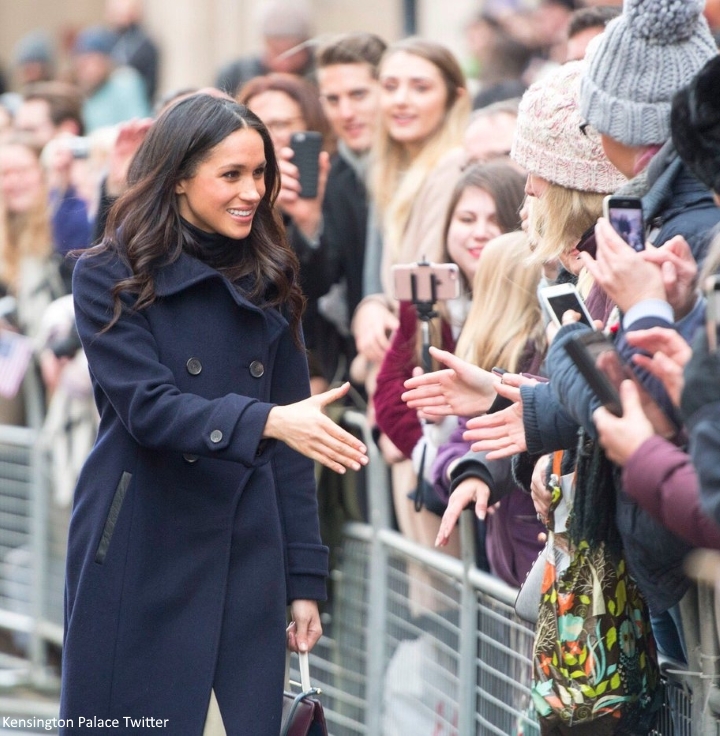 The visit will mark Meghan's second official day of duty following a successful day of engagements in Nottingham on 1 December to highlight World Aids Day. 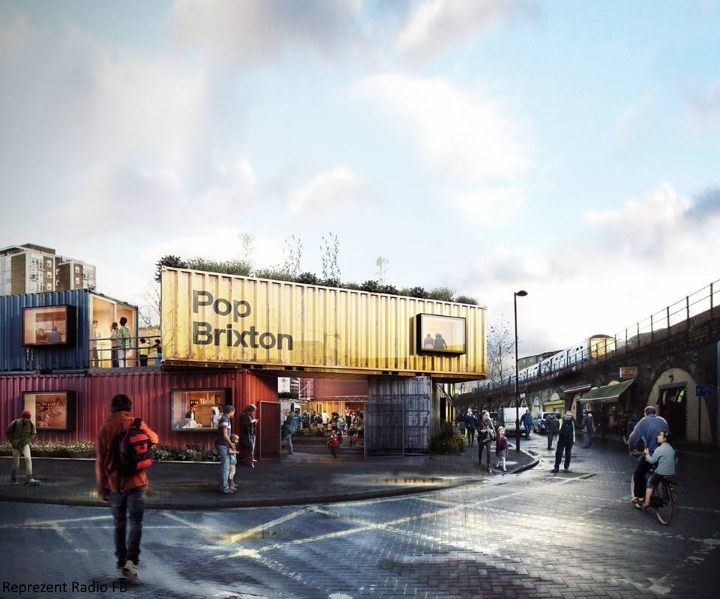 Harry and Meghan will definitely be welcomed in Brixton as it is a very diverse part of London. It is a really cool place with fabulous restaurants and clubs, a brilliant West Indian market and trendy cinema. I've spent many an evening in Brixton - bet the people there will be thrilled as they often get left out of things in the UK. You're welcome. I reckon there will be pandemonium on the 9th January - I can't wait!!! Harry and Meghan and definitely the best royals for this visit. So glad to see they are promptly getting on with it! Also great to see the staggered dates with the Cambridges...more fun for us and better exposure for the BRF as well. Fun! Thanks for all the updates, beautiful pictures & background info.. Your blogs are my favorites! Hope you had a Merry Christmas & Happy New Year! Imagine just hopping on a helicopter for a quick trip to Monaco, to celebrate the New Year. Such glamour to help balance the workload. What a life! Laura, I agree, that would be fun! It would be fun no matter how heavy or light ones workload. I have never been to Monaco, but it would be fun to visit. Actually, I have been to Monaco and it is quite the place. Most of the yachts in the marina are worth way more than my house Is worth. I saw one with a helicopter and a landing pad at the back of it, which tells you have big the actual ship was. It was fun to see where the Grand Prix car races take place. But alas, I was not invited to the Palace. I'm quite impressed that Meghan is already taking on some royal duties e've though she's not even an official member of the Royal Family! She's certainly showing a great willingness to plunge into charity and public work, even if she's not doing it alone yet (which probably wouldn't be appropriate since she won't take on patronages until she's an HRH). She's been very involved in world charitable activities already, with World Vision Canada and the UN, and there are some lovely videos of her charity work online already -- helping World Vision drill wells in African villages, for example, and being very straightforward about the effects of easy access to clean water on girls' ability to stay in school and deal with health issues. I think she's going to be a huge asset for the Royal Family; and I'm sure she and Harry are going to be working together a lot, too, especially on children's issues, which are so close to Harry's heart. And as an American, I know I'm going to be hugely proud of her in future years, using her platform for good just as Diana did. She's a remarkable young woman, and I'm thrilled she and Harry have found each other! It's a real love match, for sure! I agree. Meghan appears very eager to plunge right in. It is not unprecedented, however. All engaged couples in the BRF have done joint engagements before the wedding. I think it's a way to introduce the fiancee to the public and vice versa. She is older than Diana was when she already has tons of charity. She is exactly as old as Diana was when she died. So somehow I can't buy into "remarkable young woman" with Meghan being closer to 40 than to 30 as well. Imke I agree. Meghan is a grown up 36 year old woman who has worked for many years both in the entertainment world and with philanthropic projects. She also has been married and gone through a divorce. All these things most likely make her a relatively mature woman. I think most women in their 30's would behave just as Meghan has at least in terms of jumping right into engagements etc. I'm wondering what we ought to "buy into" in place of "remarkable young woman"? That surprised me. Started me thinking about age descriptors as they pertain to women in general. Shall we start saying "remarkable soon to be middle-aged woman" instead? Or leave it at "remarkable woman"? The barometer of youth has moved since the 19th and 20th centuries. Probably because the average life expectancy for women was 46 in 1900. Now it's closer to 86 in most first world nations. Possibly Meghan and Catherine might still be described as "young" whereas Sophie would not be. However, using the adjectives to specify age at all is not strictly necessary--especially since the adjectives often work to taint, even if only slightly, the "remarkable woman" in question. Meghan is a remarkable woman and it is not necessary to define her as old, or young, or middle age. As someone, who has turned 70, mid 30s is young to me. But it is all relative. She is "young":), but she has plenty or experience. Diana was both young and inexperienced. So true that ones perception of age is always relative to ones own:). 🌼 Nice that they are friends with Albert and Charlene. I think that they will probably make a lot of visits with them in the future. Nice little bolt hole to have and sweet company. They know each other not sure how close of friends. I do not see the four of them as being good friends, they all just seem to be of enough different ages and stages of their lives to not have many similar interests. Albert is 59 and while Charlene is closer in age at 39 she seems of a very different generation than Harry and Meghan somehow. I could be wildly wrong but at least from the outside those are my impressions. Surfer Girl, I think that all of the European Royals have at least a connection with each other. Many are from the same lineage. But I'm not sure they have the time or inclination to be friends. Geographically they live far apart. They see each other at weddings and funerals…not unlike how it is for us with some family members. On the other hand, I see the Obamas as being lifelong friends to Harry and now Meghan. Albert and Charlene are very sport-minded. Perhaps there is an Invictus discussion going on and charity business may have been combined with pleasure. That's entirely possible. Looking forward to their engagements. I wonder if they will be giving any speeches, both she and Harry, or will she only give speeches after she's officially HRH. I am imagining whether she will wear a combination of already seen clothes (navy, white, or camel coat or plum or gray leather jacket) or something new. And I'm glad they got to do something fun for New Year's. I know very little about her so she could wear clothes she has had for ages and I would be clueless:). Will be fun to watch her fashion evolve over the next few years. Wow, Prince Harry wasn’t kidding when he said, “we’re ready to get to work, lots to do”. Thanks, Charlotte. @Monica. I was thinking the Lotus Flower Tiara. Maybe with a few alterations, to give it a younger look and feel. Maybe have the pearls removed and a couple of diamond arches added. Something Meghan could have as her 'go to' tiara, as Kate has the Cambridge tiara. I was thinking she could use it as a wedding tiara only and go with something else as her go to tiara. Annabel,Kate has already the the Lotus Flower Tiara,so Meghan cannot have it. Monica,the Girls of Great Britain & Ireland Tiara is the favorite tiara of Her Majesty the Queen. I think Meghan could wear theDiamond Lonzenge Bandeau Tiara or the Strathmore Rose Tiara,or a new one!!! Annabel, I can't see the Royal jewels, especially tiaras, being changed to suit any one person, new to the Royal family. Maybe after someone is in the Royal family for a length of time and perhaps inherits a piece of jewellery, changes could be made. But I doubt it will happen just yet. have resurfaced redone with points and pearls. It the latter the one you meant? I would love to see the Strathmore resurface also. Apparently it hasn't been seen for decades. I vote for the Strathmore! I think its one of the prettiest tiaras out there. Also,if Meghan goes with a more modern fluid design for her gown, this tiara would go nicely. This tiara could be worn topped with 13 pearls. Charlotte.😊 There is an excellent article today in "The Sun" by Haley Richardson about the tax implications inherent in Meghan being a U.S. citizen while the wife of a Royal. Contributors to the article are Marlene Koenig, David McClure and Diane Maheny, all very credentialed. Very interesting article with some excellent additional resources given also. Have you seen that article? The Sun, "CASH OUT....", Haley Richardson, 1/4/18. Oh, I did read and saw that her stylist, Jessica, has a wonderful wedding site---the photos are just beautiful, and I think we can expect a very personal dress. As gorgeous as Kate is and as incredible as her style choices are, her dress seemed to "stiff" for my tastes, and I think MM will have one that is more "fluid." Allison, I agree with you…how would the tabloids know this important piece of information? It is pure speculation to sell papers. At some weddings today, when the bride is a bit older, independent, with a career, the brides walk themselves. Really being "given away" is an archaic tradition…sweet, but totally unnecessary. No one gave me away. My husband to be and I walked down the aisle together. We had a big formal church wedding. My father had passed away and there wasn't anyone else I wanted to "give me away". Never regretted it and felt rather avant garde about the whole thing. So there are several possibilities out there for Meghan although not sure how any deviation from the norm might play out in a televised wedding as formal and traditional as a royal wedding. Do we know how her processional played out at her first wedding? If her father was at least present? I believe it was fairly casual but still. If her dad is actually in her life I would not be surprised if both her parents walked her down the aisle. And I'm of the camp that the reasoning behind the tradition rankles me and would opt out of that if I were to ever have a traditional wedding. I do understand that many either don't know or don't care about the past and see it as a sweet moment, I certainly don't judge anyone else for doing it! Charlotte I'm so excited to what to come this year for Meghan and Harry and can you believe that the biggest wedding of the year is only in four months. I have strong feeling that Meghan has already choose who is going to design her beautiful gown for her big day. I'm so excited for the big day,I know Meghan is going to look absolutely gorgeous on May 19th. Now talk about fashion,in my personal opinion I think Meghan is going to be one of the most stylish royal in Europe because her style is refreshing. glamorous, elegant, classy, adventurous, and very edgy. Also Meghan's style reminds me of Queen Letizia Of Spain's style because Letizia has a very adventurous and glamorous style which I love so much and it reminds me so much of Meghan. Allison it has been my personal thought all along that Meghan's father would not attend the wedding and that her Mum would do the honours. As it is a second marriage it would be nice and different if she wore something edgy reflecting that. There is no precedent in the Royal family for tiara and veil for second marriages. I too wonder if Meghan's wedding dress will be different, due to the fact that this is a second wedding. Both Princess Anne and the Duchess of Cornwall wore something that did not resemble a bridal gown. If you Google this you will see photos. Princess Anne wore a knee length dress, that looked like a simple day dress she might wear to a visit a charity. Camilla's outfit, although quite beautiful, was not in white. I guess we will have to just wait and see. This may be a duplicate. My guess...white classic but with a modern twist dress, a veil and tiara. I am basing this on the fact the Harry has never been married and on their engagement photos. If I was marrying in that venue and I was in my thirties I would make it as traditional and beautiful as possible and reasonable with budget constraints. Even Royalty have budgets. I hope she wears a traditional wedding dress. It's a second wedding for her but a first and long awaited wedding for P.Harry. I kinda hate to see MM's gorgeous hair covered by a tiara. I would like to see something lacy and unsymmetrical on top (like her engagement gown extra in white or cream) and then a flouncy bottom. And interesting flowers. I also think she has been planning this for some time---I think she and Harry decided early that they would be together. They may have married in Africa and already considered themselves to be married. It should be quite fun to watch it all unfold! Why would you thinking they married in Africa? One can't just show up in a county and get married…well perhaps other than Vegas. They'd have to do the paperwork and have some form of residency there. There is so much speculation about all aspects of this relationship. I think we need to stop guessing about many things and as you say, "watch it unfold." I was thinking back to much earlier reports that "The couple are 'now wearing Zulu betrothal bracelets' said to feature a pattern which denotes their status as 'married'. Not legal with paperwork but more spiritual. I kind of think they did something very private and symbolic for themselves in Africa. I would not be suprised if they had a spiritual ceremony and that they are now having the formal ceremony. Thank you for sharing the link,I love the dress,really chic and appropriate!